Unity between Hamas and Fatah important for "two-state solution", says EU foreign policy chief. 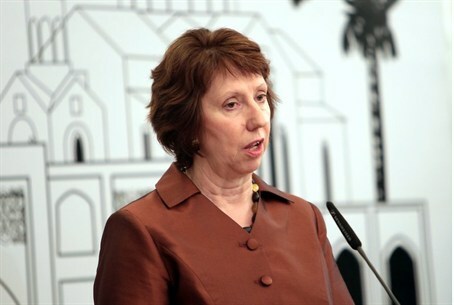 European Union foreign policy chief Catherine Ashton on Thursday called for the end of divisions between the Palestinian Authority-based Fatah and Hamas factions, AFP reports. Ashton made the comments during talks with PA Chairman Mahmoud Abbas. A statement from Ashton's office said she reaffirmed support for the PA’s state-building efforts and for the need for the factions to reconcile "as an important element for the unity of a future Palestinian state and for reaching a two-state solution." Hamas violently took control of Gaza in 2007, setting up its own government there and cracking down on Fatah officials who reside in the territory, leading to the long-standing rivalry between the two factions. Fatah and Hamas signed a reconciliation deal in Cairo in 2011, pledging to set up an interim consensus government of independents that would pave the way for legislative and presidential elections within 12 months. More than two years later, the deal has yet to be implemented. The parties have argued over the make-up of the interim government, and a February 2012 deal signed by Abbas and Hamas leader Khaled Mashaal in Doha intended to overcome outstanding differences was opposed by Hamas members in Gaza. Hamas opposes the appointment of prime minister Rami Hamdallah, choosing instead to recognize its own Haniyeh, and also no longer recognizes the legitimacy of Abbas, whose four-year term as PA Chairman ended in 2009, and new elections have not been held since. Abbas’s meeting with Ashton is the latest in a series of meetings he has held with European leaders over the past several days. He has taken advantage of the trip to condemn Israel and claim that the “settlements” are an obstacle to peace. On Wednesday, Abbas urged European and other foreign companies not to deal with businesses based in Israeli communities in what he considers “occupied Palestinian territory” - meaning eastern Jerusalem, Judea and Samaria. "I call on European companies and foreign companies doing business in the settlements to put an end to their activities," he said after a meeting with European Council president Herman van Rompuy in Brussels. A day earlier, Abbas warned that Israel would be to blame if ongoing peace talks collapsed over its demand to keep military forces in the Jordan Valley. "We will not accept it, and if they (the talks) collapse, they (Israelis) will be the reason for the collapse, not us," he said in an interview with the Baltic News Service.